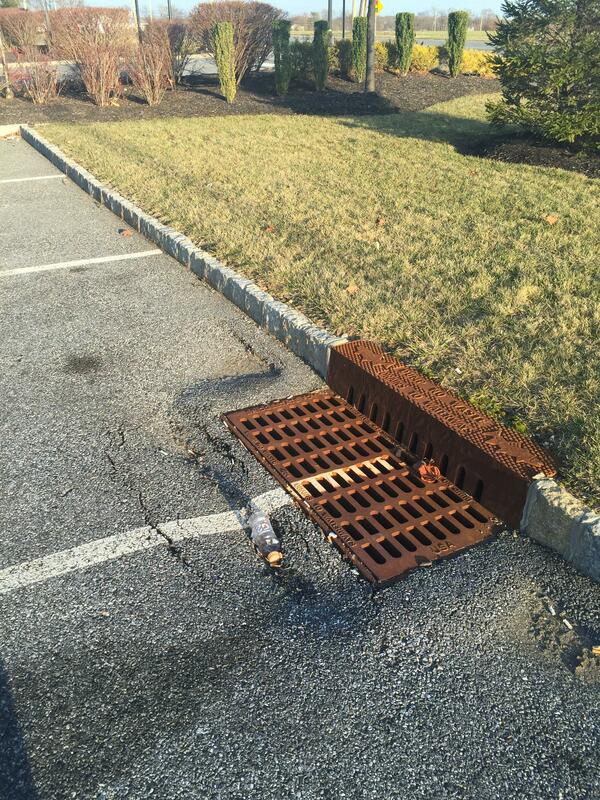 What are Catch Basins And Why Do They Fail? Catch basins work as a drainage system for your parking lot. 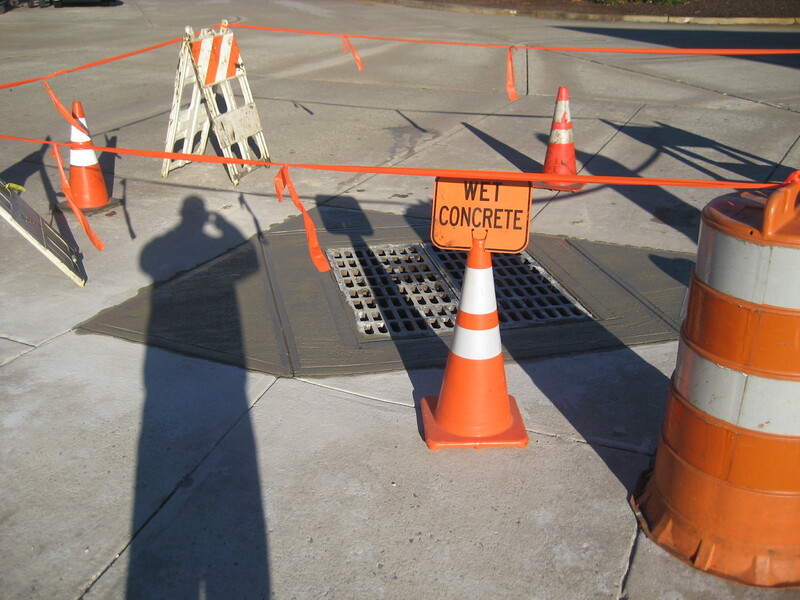 They are built into an asphalt or concrete parking lot to redirect storm water. 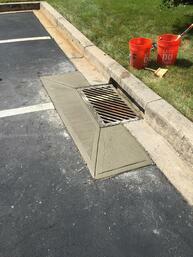 All catch basins will settle or deteriorate over time. As water enters the basin, the joints between the frame and grate casting, blocks or mortar joints becomes weak. The water will eventually disintegrate the mortar. It's very simple. When this happens, especially during the colder months, the water will expand and contract in the openings. This causes the mortar to “pop out”. This can cause a large issue in your parking lot. In addition, cracks can appear around the perimeter of the catch basin and allow water to infiltrate the casting. If either of the above happens, the catch basin may begin to settle around the perimeter. This will further allow standing water to accumulate. If its winter, the standing water will freeze, and may become a potential liability. At this point the asphalt around the basin may begin to see some cracking. As the cracks continue to spread outward the asphalt will begin to deteriorate. The casting may settle as the mortar “pops out” and an asphalt lip may appear. This will cause a tripping hazard. This happened because a section of the casting or wedge blocks may have fallen out from normal parking lot traffic . Worst case, the top row of block may completely fail and allow the casting to cave in. 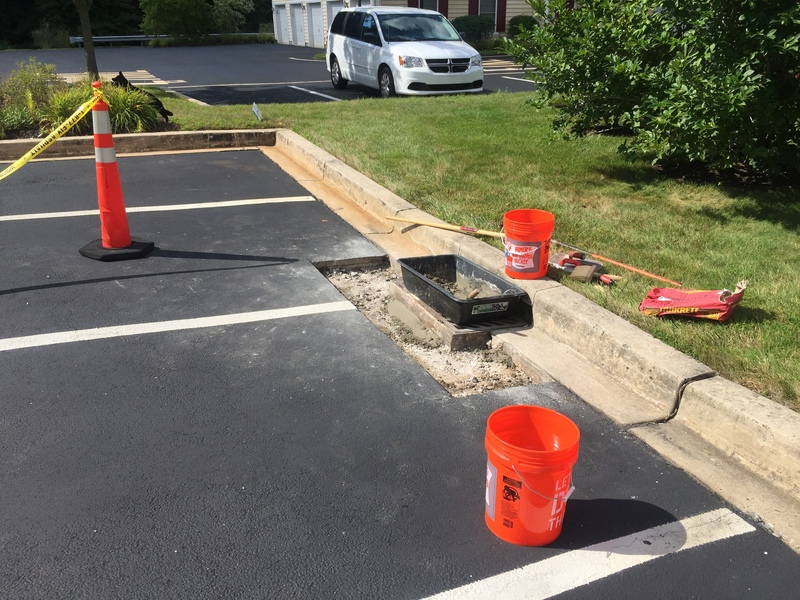 Our catch basin repair services can be as simple as patching the asphalt around the perimeter with a quick mortar repair, or we could provide an in-depth scope and complete structure rebuild. 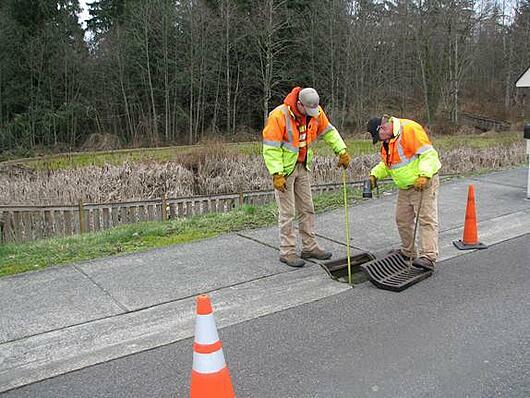 Either way, we will get your catch basin working. 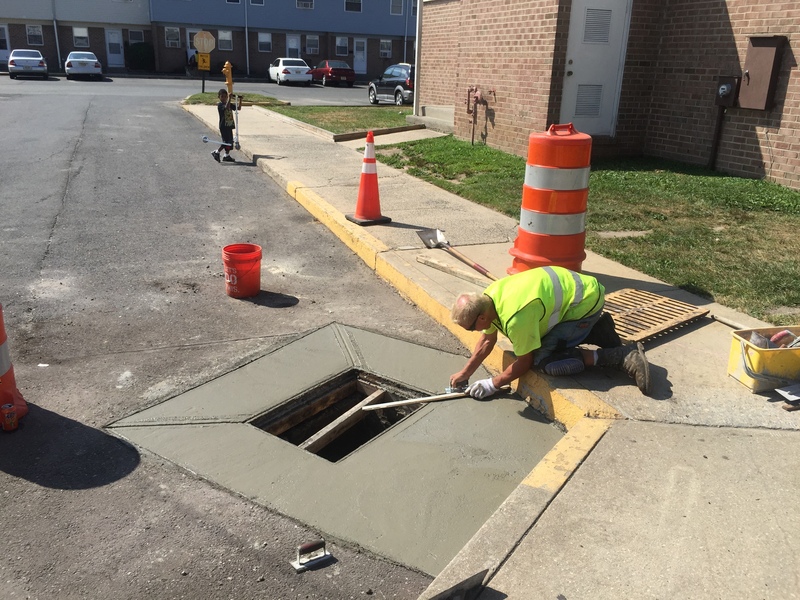 Structurally concrete will last 4 times longer than asphalt as a collar for storm drain repairs. 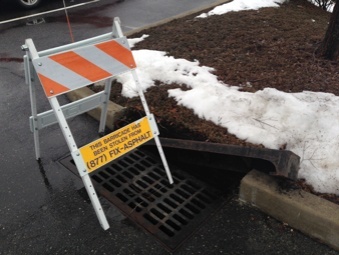 Even after rebuilding and parging the inside of a catch basin there is still a risk water will migrate between the asphalt and the cast iron frame at some point in the future. In the winter this water will turn to ice and over time will damage the block. When asphalt is used as a collar and the brick begins to deteriorate a sink hole will develop around the perimeter. Once the sink hole develops it will only be a matter of time and the weight of a parking lot sweeper or snow plow truck before the catch basin perimeter collapses. When concrete is used in place of asphalt it has much greater tensile strength combined with steel reinforcement similar to concrete bridge decks. If a bridge deck was to develop a hole through the entire substrate, the bridge deck would remain in tact as the steel reinforcement would keep the surrounding concrete together. In the same theory, if a sink hole was to develop around the perimeter the concrete would bridge the hole and prevent the concrete from sinking into the catch basin. 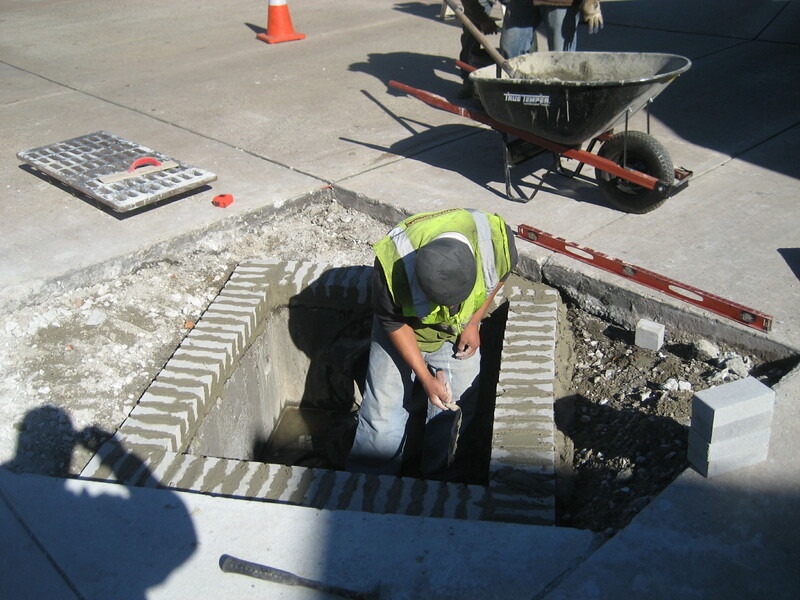 Concrete collars around catch basins are installed between 6" - 12" thick and range in perimeter from 12" - 36" wide. 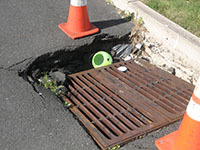 What is the cost to repair / rebuild a catch basin? 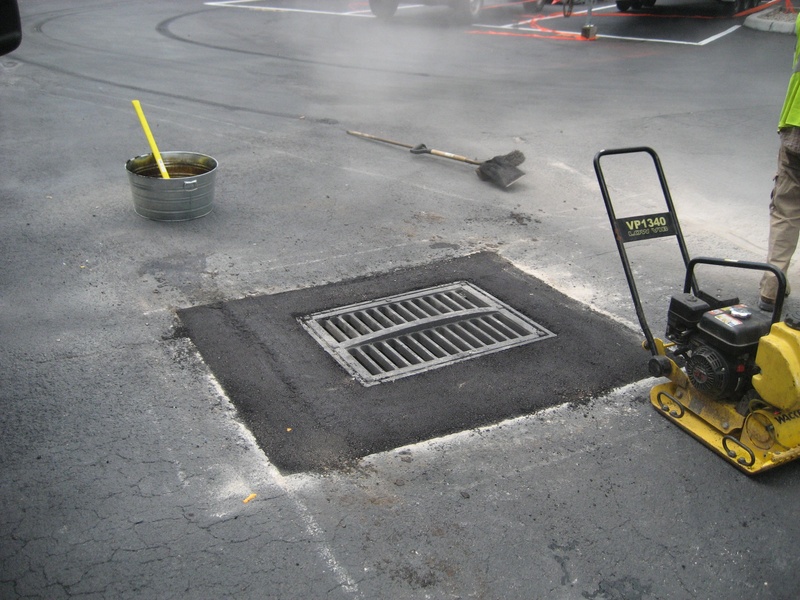 For an asphalt perimeter rebuild costs range from $2,200.00 - $3,000.00. For a concrete perimeter costs range from $2,500.00 - $3,500.00. 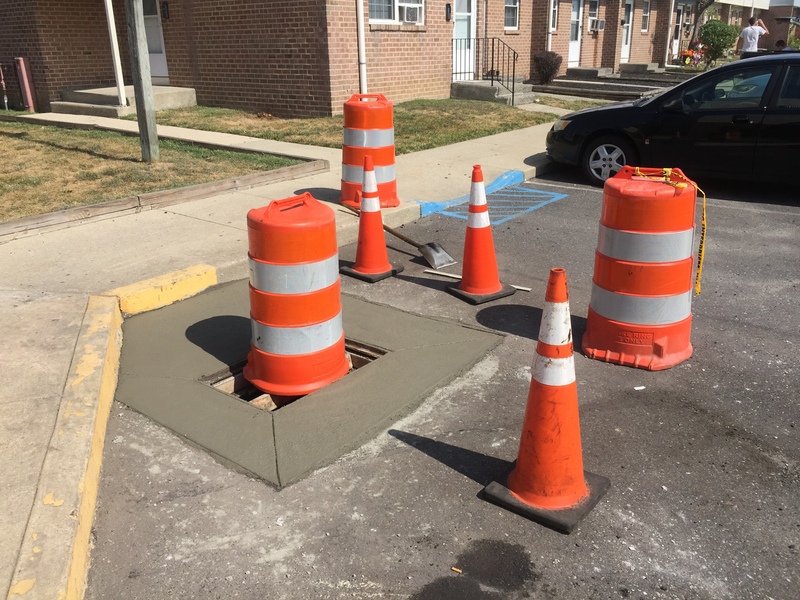 Quantity of catch basins to be rebuilt? How many rows of block have to be replaced? Does the frame and grate need to be removed or can it be repaired "in place" with forming and bricks? Does the frame or grate need to be replaced from snow plowing damage? 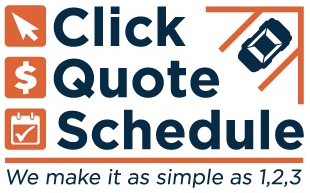 We will inspect your catch basin(s) for damage and email you a quote the same day from the site after our inspection with pictures and an itemized report.